Custom mode lets you create your own shooting modes by customizing options and saving them. You can save frequently used option settings as a named Custom Mode, and then use it as your own shooting mode customized for the shooting environment. Use custom mode when you capture photos in various environments, you have preferred shooting settings, or you frequently use preset options in certain conditions. Note: You can create and save up to 40 custom modes. 1. 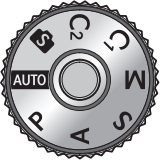 Rotate the mode dial to P, A, S, M, C1, or C2. 2. Set shooting options to the settings you want to save as a custom mode. 3. Press [MENU], and then select → "Manage Custom Mode" → "Save." • You can also save a custom mode by touching or → "Save" on the screen. • You can also save a custom mode by pressing [Fn], and then touching . 4. Verify the shooting options, and then select "Save" or "Save as." 5. Use the on-screen keyboard to enter a name for the mode. 6. Press [ ] to save the mode name. 7. Capture a representative photo for the mode to save. 1. Rotate the mode dial to C1 or C2. 2. On a pop-up window, select "Yes" → a custom mode. • You can also press MENU, and then select → "Manage Custom Mode" → "Open" → a custom mode. • You can also touch on the screen and select "Open" → a custom mode. • If there are no custom modes saved yet, you can select a shooting mode from a pop-up window on the camera, set shooting options, and then save as a new custom mode. 3. Verify shooting options, and then select "OK."
2. Press MENU, and then select → "Manage Custom Mode" → "Delete" → "Multiple Delete." Note: To delete all the saved custom modes, select "Delete All," and then select "Yes" when the pop-up message appears. 3. Select a custom mode to delete, and then press the trash can icon [ ].